What is a "Power Member?" If you're already a member of the Central Pennsylvania chapter, you can become a member of the ATD national organization for a discounted rate. This joint membership offers you a unique opportunity to connect with local, national, and international professionals. Just some of what you'll receive includes access to additional research and premium content, discounts on ATD events, access to the ATD video library, and templates that you apply right away! 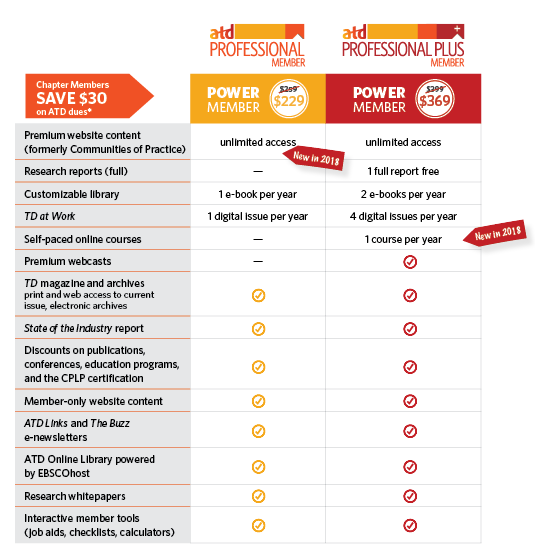 ATD offers two levels of Power Membership: Professional ($229) and Professional Plus ($369). Take a look at the Power Membership Benefits Handout to compare the advantages of both membership levels. If you're ready to become a Power Member today, fill out the Power Membership Application. Our chapter code is CH2007.